Last time, I discussed my nostalgia for wing windows on the the old cars from the sixties. But let’s face it, with fall weather moving in I wouldn’t be using them right now if I had them. So let’s move on to another thing that has gone the way of the Dodo, the art work that used to be found on 12 inch album covers. Album cover from Pink Floyd’s Dark Side of the Moon. 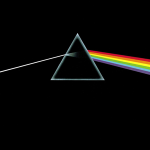 One of the basic experiments in high school physics class is showing that white light breaks into a spectrum of colors when it shines through a prism. This was an easy one to remember not because we learned this from our teacher as much as we remembered the art work on the Pink Floyd album, Dark Side Of the Moon. This is one example of art work that was found on the covers of vinyl record album covers. 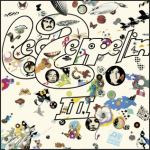 Another one of my favorites was the Led Zeppelin III album. The album cover with the rotating volvelle was one of the original examples of user interaction. I’ve always really loved getting the Led out. I lost my virginity and a great deal of my hearing somewhere between the Immigrant Song and Gallows Pole. 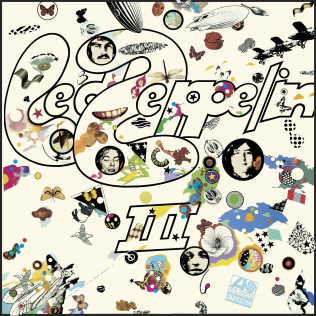 Led Zeppelin III album cover. In the late 1970’s, I dated a girl whose roommate was the manager of a record store. (Anyone been to Homer’s in the OM lately?) Her record collection was packed tight on a shelf measuring 10 and half feet. The girl had an encyclopedic knowledge of obscure music in addition to albums you could otherwise only hear on underground FM stations in the 70’s. I would spend hours listening to her collection, marveling at the art work on the covers of albums that I’d never heard of and wondering if I was dating the wrong roommate. These days most music collections are just a bunch of computer files on a hard drive or smart phone. There is no physical art connected to the music other than the icon sized pictures on the playlist in the software. Sure you can still find a lot of the vinyl albums (For instance, used LPs at Homer’s) but only OCD afflicted rich guys make the effort. Yes, I’m definitely on the side that says nothing sounds better than analog albums played on a Garrard turntable with a Pickering cartridge and output to a Bogen Amplifier and Jensen speakers. But today unless you live in an anechoic chamber and have no neighbors within a football field’s distance, you have no hope of getting the “live performance sound” anyway so why bother? Earbuds just don’t make the quality of noise canceling headphones either. Since I’m usually singing along off key with the music anyway that makes it hard to fully appreciate the original artist’s talent. And let’s not even mention the several friends I have that are using those turntables that have a USB output so they can put all their vinyl to digital. Let’s not mention that because I’m doing the same sort of thing with several thousand dollars worth of DVDs and VHS tapes that I want to see using iTunes. I’ve already finished ripping hundreds of CDs I bought in the 80’s and 90’s. Yeah, I know it’s a huge copyright grey area. But what else is a person supposed to do? Otherwise, every time the media technology changes I have to buy The White Album again. And for the record (pun intended) pictures of album covers are used under the fair use clause of the United States Copyright laws and are copyright by their respective music groups and publishers.